Help Documents - Version 5 Add QuestionsHow do I install a "kill switch" to prevent an unqualified registrant from registering? If your event requires certain conditions to be met before allowing a registrant to proceed with registering, you can prevent them from submitting their registration form if the condition is not met. Where is the "kill switch" located? The kill switch is added to a question response in the Questionnaire Wizard (Survey Questions). 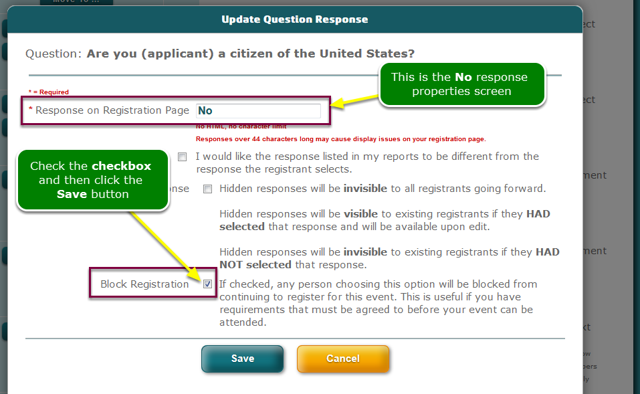 For example, say you had this requirement: To register, you must be a citizen of the United States. 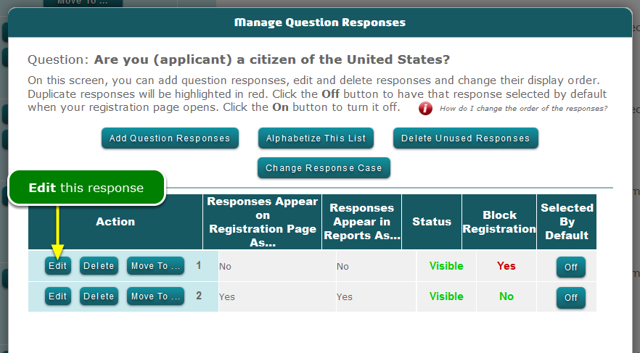 So you set up a question in the Questionnaire Wizard that asks: Are you a citizen of the United States? Where do I install the kill switch? You attach it to the question RESPONSE that will trigger the kill. There are 2 responses possible: a No and a Yes. If No is selected, the registration should be blocked. If Yes is selected, registration may proceed. We're editing the No response. What will the registrant see? If a registrant selects the No response, he/she will see the red message below after they click the Submit Registration button. Registration is thus disabled. Prev: How do I set up a Waiver question? Next: How do I require a File Upload (example: Resume)?